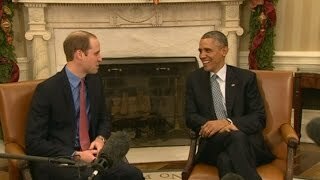 William tells President Obama about the "chaos" of Prince George's birth and reveals he forgot to ask if he was a boy or a girl. Dec 09, 2014 · William tells President Obama about the "chaos" of Prince George's birth and reveals he forgot to ask if he was a boy or a girl. .
Dec 08, 2014 · Prince William tells Barack Obama about the “chaos” of Prince George’s birth. Dec 08, 2014 · The two men met in the Oval Office during the Royal visit to the US. Prince William tells Barack Obama about a “chaos” of Prince George’s birth. Prince William tells Barack Obama about the “chaos” of Prince George’s birth. Reese Witherspoon on Meeting the Duchess! Charlamagne: "There's Gay, Straight & Drake"